Hickey, Donald R. Don't Give Up the Ship! 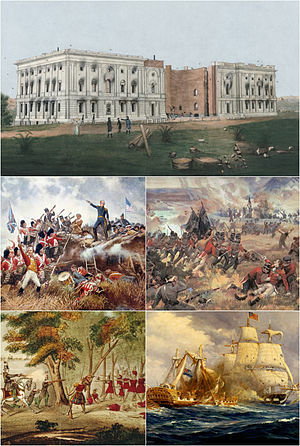 Myths of the War of 1812. (2006) ISBN 0-252-03179-3 (hardcover). Hickey, Donald R. The War of 1812: A Forgotten Conflict. ISBN 0-252-01613-0 (hardcover); ISBN 0-252-06059-8 (1990 paperback). Brown, Roger H. The Republic in Peril: 1812 1964. Horsman, Reginald. The Causes of the War of 1812. 1962. ISBN 0-374-93960-8 (1972 printing); ISBN 0-498-04087-9 (2000 printing). Marshall Smelser. The Democratic Republic 1801-1815 (1968). Hickey, Donald. 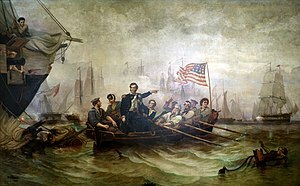 The War of 1812: A Forgotten Conflict. 1989. ISBN 0-252-01613-0 (hardcover); ISBN 0-252-06059-8 (1990 paperback). Allen, Robert S. "His Majesty's Indian Allies: Native Peoples, the British Crown, and the War of 1812" in The Michigan Historical Review, 14:2 (Fall 1988), pp 1-24. Benn, Carl. The Iroquois in the War of 1812. Toronto: University of Toronto Press, 1998. ISBN 0-8020-4321-6 (hardcover); ISBN 0-8020-8145-2 (paperback). Berton, Pierre。The Invasion of Canada. Toronto: McClelland and Stewart, 1980. ISBN 0-316-09216-9. Carter-Edwards, Dennis. "The War of 1812 Along the Detroit Frontier: A Canadian Perspective", in The Michigan Historical Review, 13:2 (Fall 1987), pp. 25-50. ———. "On to Canada: Manifest Destiny and United States Strategy in the War of 1812" in The Michigan Historical Review, 13:2 (Fall 1987), pp. 1-24.